This 100-Day Accountability Report [link] gives a progress update on recommendations to reform Cook County that the Civic Federation made in its Cook County Modernization Report. The 100-Day Report provides an overview of key events in the transition to the new administration of Cook County Board President Toni Preckwinkle, summarizes key findings from the Modernization Report, provides an update on the County’s budget since publication of the original report and includes detailed information on the status of all 36 recommendations. The administration of Cook County Board President Toni Preckwinkle, who took office on December 6, 2010, has made considerable progress in implementing Modernization Report recommendations in the first 100 days. 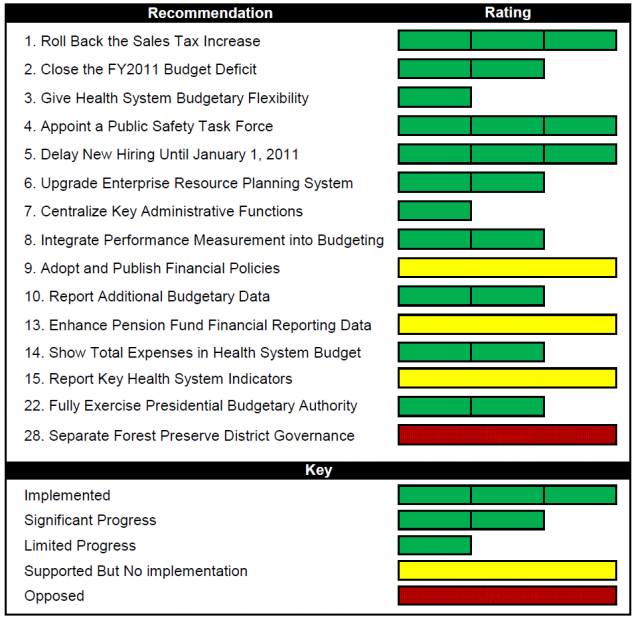 To the right is a chart summarizing the ratings the Civic Federation used to identify the status of the recommendations 100 days into the new administration. While the Civic Federation is encouraged by the reforms that have already been implemented, much remains to be done to improve the County’s operations. The Civic Federation is concerned about actions taken during the FY2011 budget process that infringe on the budgetary independence of the Health System and about the administration’s opposition to a separate governing structure for the Forest Preserve District. Click here to download the complete Civic Federation 100-Day Accountability Report. Click here to read the press release for the report. Cook County Board President Preckwinkle has also released her own 100-day progress report. Click here to read that report.